Best friends in small-town New Hampshire, Jon and Chloe share an intense, near-mystical bond. But before Jon can declare his love for his soul mate, he is kidnapped, and his plans for a normal life are permanently dashed. Four years later, Jon reappears. He is different now: bigger, stronger, and with no memory of the time he was gone. Jon wants to pick up where he and Chloe left off—until the horrifying instant he realizes he possesses strange powers that pose a grave threat to everyone he cares for. Afraid of hurting Chloe, Jon runs away, embarking on a journey for answers. Meanwhile, in Providence, Rhode Island, healthy college students and townies with no connection to one another are inexplicably dropping dead. A troubled detective prone to unexplainable hunches, Charles “Eggs” DeBenedictus suspects there’s a serial killer at work. But when he starts asking questions, Eggs is plunged into a shocking whodunit he never could have predicted. With an intense, mesmerizing voice, Caroline Kepnes makes keen and powerful observations about human connection and how love and identity can dangerously blur together. 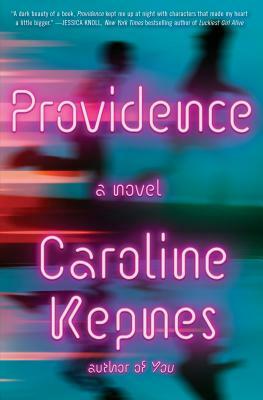 Caroline Kepnes is the author of You and Hidden Bodies. She has worked as a pop-culture journalist for Entertainment Weekly and as a TV writer on 7th Heaven and The Secret Life of the American Teenager. Originally from Cape Cod, Massachusetts, she now lives in Los Angeles. This book is the definition of bittersweet. It will make you laugh out loud and then make you ugly cry. It's an epistolary novel that deals with grief, love, family, and friendship. I absolutely love it. For those who loved "Where'd You Go Bernadette" and "Eleanor Oliphant is Completely Fine."